The carnival will feature free concerts, cultural display and performances from the college stars as well as ace musical acts at the Marwa Beach on Saturday and Sunday. The University of Lagos finest musical acts combined with their Redeemers, Babcock and Covenant, Yabatech and other counterparts would headline Friday night. This will be infused with the first phase of the TC2 Beach Soccer Cup where participating teams would slug it out for a place in the Finals. The headlining acts for Sunday would be a fuse of Bugzy Dvinci, Jirom, and Two Surprise A-list Acts - Wanna know who they are? Why not join us!, Meanwhile the finals for the TC2 Cup will also be played before hand and the winners go home with cash prizes as well as Bragging Rights for the Year. Okereke Fellowship is the curator of this project. In a brief interview with him as regarding the event he said “The College carnival is established as a medium to foster unity between and amongst the tertiary community and give the Youth a new narrative that preaches self-reliance and economic empowerment by using the socialization as machinery for replacing apathy with vision, focus and determination to excel in their endeavors. It also a means to imbibe the traditional Arts and Culture of regions into contemporary Nigeria as well as use pop culture to reach the Youth whose cultural values are almost lost”. The College Carnival will be held at the Marwa Beach on Saturday and Sunday, bringing a plethora of cultural music, dance demonstrations, speciality vendors, and more. 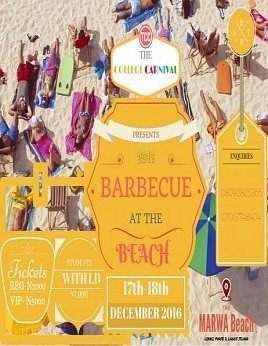 A limited number of tickets for the Barbecue at The Beach will be available for sale at the Beach entrance, Bus Pickup points on the carnival days, or in advance through Afritickets at www.afritickets.com. VIP and Beach Cabana Viewing passes offer access to an area right in front of the stage for the best views of the shows. For more information and/or sponsorship enquiries on The College carnival Contact the Organizers via email thecollegecarnival@gmail.com or call +2348090825365.